I schlepped over to Ataköy in the Bakirkoy district where the spanking new Hyatt Regency hotel is located, eager to discover VUE, one of its two dining outlets that was ostensibly offering authentic Peruvian ceviche and other Latin American delicacies that have yet to be listed on the menus of other restaurants hereabouts. The third local five-star Hyatt property, with 284 rooms and 30 suites, is situated adjacent to the Ottoman baruthane – or old gunpowder factory at the edge of the Marmara Sea in Ataköy, a high-end residential area which is only seven kilometers from Atatu¨rk International Airport. The hotel was built with a maritime theme in mind and implemented on a grand scale in the building’s luxury-cruise-ship exterior, complete with a bow and bridge and an interior atrium of layered decks. This maritime theme also informs the architectural layout, with aquatic decorative elements in navy and turquoise referencing the country’s rich naval history. Iconic Turkish patterns and shapes have been tastefully applied to furnishings in an overall subdued color palette of beige and earthy colors while “East meets West” accents imbue a more contemporary international style. The water concept ties into the hotel's geography and was especially discernible in the two dining options. 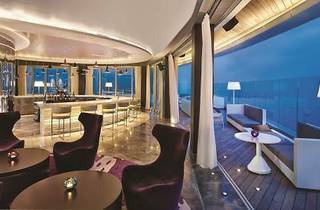 Brizo, on the ground floor, with a focus on seafood and Eastern Mediterranean cuisine, opens out into an unimpeded view of its swimming pool and sun deck and, a short distance away, of a narrow strip of public beach by the Marmara Sea. 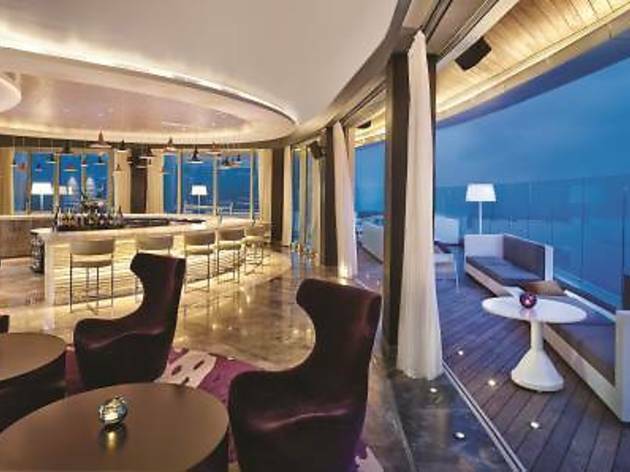 Meanwhile Vue, the lounge bar with tapa-style dining and a wrap-around terrace located on the 17th floor, commands a panoramic sea-and-city view that, on a clear day, can extend to the Marmara islands. Whilst staying at the hotel, I decided to make the most of the opportunity to sample the food overseen by 28 year-old executive chef Alex Moser, a Berliner who matured as a chef thanks to several Hyatt international postings, seeing him sore from chef de cuisine at 16, to executive chef at 24. My Saturday evening dinner was therefore an unusually protracted affair, starting at Brizo and continuing in Vue, where another 28 year-old, the Peruvian chef de cuisine Bruno Andres Santa Cruz Gavidia personally prepared a degustation of his signature dishes. Noticing Indonesian cooks behind one the open kitchen stations, I naturally zeroed in, ordering a few Asian favorites which were promptly served with three condiments to choose from: chili sambal, chili-lime dressing, hot sauce and pickled chili. My nose immediately perked up to the gingery broth in the bowl that contained delicate medium-sized wontons and chicken slices. It was very close to my memory of the same dish in my last visit to a New York Chinatown restaurant. Beef tenderloin fillet cubes were marinated in black pepper then stir-fried in oil and starched sauce with tomato and red onion to lessen their spiciness. The meat came out smooth and tender. Squid, shrimp and red onion mixed with Japanese-type thick wheat udon noodles saute´ed with a starchy sauce finish and served with a cilantro leaf garnish. I couldn't tell if a dash of the amber-colored brandy produced in the Peruvian city of Pisco got into the leche de tigre or “tiger’s milk” that the juicy scallops were subjected to. The pomegranate sauce and seeds added a delightful bubble-gum pink color to the citrus-based ceviche marinade of lime, milk and coriander . There was a refreshing Thai twist in the choice of the marinade’s creamy ingredients. Coriander gave the unsweetened coconut milk a lemony aftertaste and sharpened the lime. Definitely my favorite of the ceviches I savored. I’ve tasted a similar ceviche in Mexico and this one was just as wonderfully sweet- and-sour. The tender and soft sashimi-grade tuna lay in a concoction of lime juice, chilies, mango, passion fruit and sweet corn. The fruity sweetness of the latter three ingredients balanced the tangy acidity of the marinade and lent it colors. This traditional Peruvian chicken dish is said to have been invented by exiled French chefs in Peru having fled the French Revolution. Served slightly spicy and richly covered by a walnut cream, and accompanied with roast potatoes, it had a delightful complexity. Lime and coriander further gave it a citrus pungency while yellow chili paste gave it a bright color. The simply prepared boneless meat – by grilling – was covered and given its ethnic flavor by chimichurri - Argentina’s favorite pesto- like sauce. The octopus arrived perfectly cooked with a tender texture. It was a hearty salad with two generous portions garnished with pickled radicchio and baby potato. Don’t let the word salad fool you, it’s definitely a main dish, and a tasty one. Another simple but flavorful dish from the kitchen of Vue: moist and tender beef sitting on a bowl of spiced lemon rice and black beans and topped by the Peruvian aji verde sauce that gave it a spicy kick.